Cabarrus County is located in North Carolina along the northeast border of Charlotte’s Mecklenburg County. It was established in 1792 and named for Stephen Cabarrus who was at the time the speaker of the North Carolina House of Commons. Cabarrus County holds an important place in American history because gold was first discovered at Reed Gold Mine in 1799, and until the California Gold Rush fifty years later, North Carolina was the leading source of gold in the nation. Cabarrus is one of several counties along the wagon road from Pennsylvania which brought Presbyterian Scots-Irish settlers south. 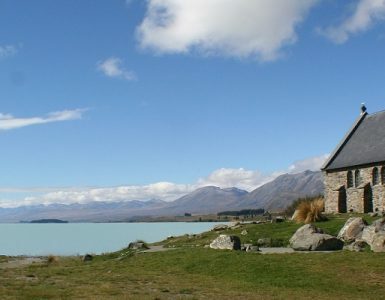 Presbyterian churches were started along the settlers’ route beginning in the mid-eighteenth century. One of those churches in Cabarrus County, Bethpage, was organized in 1794 and would come to be important in the life of Jethro Rumple. Jethro was born on the farm of his grandfather to Mary Winecoff Rumple, March 10, 1827. He was raised by his brother Levi Rumple and his wife Christina. His early studies occurred in an “old field school” which was a subscription school used before North Carolina passed its public-school law in 1839. The term “old field” derives from the construction of the schools on worn-out farmland; if the farmers had applied Exodus 23:10 it may have helped them avoid exhausted soil. Jethro’s later education was guided by Pastor James E. Morrison of Bethpage Church. His collegiate studies were completed at Davidson where he graduated with honors in 1850. At what point Jethro was called to the ministry is not known, but while teaching in a classical school for about three years he began theological studies with Rev. Walter Wellington Pharr (1813-1886) of the Poplar Tent Church. Jethro headed to South Carolina in 1854 to formally prepare for the ministry in Columbia Seminary during which time he was also licensed to preach by Concord Presbytery. He was ordained by the same presbytery and installed the pastor of Providence and Sharon Churches in Mecklenburg County on January 9, 1857. After four years he received a new call to the First Presbyterian Church of Salisbury where he was installed pastor on November 24, 1860. When he began his new ministry the church had a membership of less than a hundred, but at the end of his forty-four-year pastorate the congregation had increased four-fold. 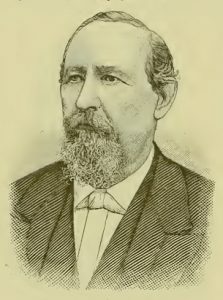 Jethro Rumple was not only the pastor of First Church but was also involved in other ministries associated with the work of the church and the community. He was the stated clerk of Concord Presbytery until he had to resign in 1868 due to an increased load of duties as chairman of the presbytery’s Sustenation Committee. After the Civil War many ministers were not receiving sufficient salaries to live on and Chairman Rumple was busy seeking funds for distribution to his colleagues in need. 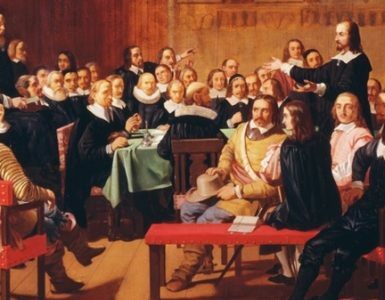 One issue of particular importance he faced in the presbytery was the establishment of Mecklenburg Presbytery from a portion of Concord Presbytery in October 1869. One key point of discussion leading up to the division was how would the oversight of Davidson College relate to the new presbytery, which was an issue of concern particularly to Rumple because of his membership on the college board. In the later years of his ministry he often supplied churches in the mountains including the Blowing Rock mission which was organized in 1887. The church was named Rumple Memorial Presbyterian Church in later years. Following the Civil War there were destitute widows and families in which the husband was unable to work due to war injuries. Households struggled particularly in the South where Reconstruction had a residual influence for a number of years. There were many children orphaned due to the loss of both parents, or in some cases children were simply abandoned. 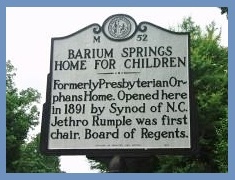 The Synod of North Carolina responded to the need and Dr. Rumple spearheaded the founding of Barium Springs Orphanage where he served as the first chairman of its board. When the original orphanage property burned in later years, the replacement facility was named Rumple Hall in his honor in 1916. He was the secretary of Davidson College’s board of trustees, 1878-1905, having been elected a trustee in 1858, and he was a director of Union Seminary, 1863-1906, including two years as the board president. Even though Pastor Rumple had not taught school in years, he continued to support education as a member of the public-school board for a number of years and as a director of the Salisbury Library Association. 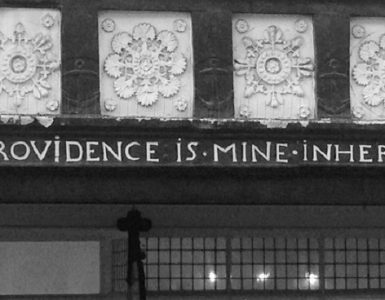 In 1882 the University of North Carolina honored him with the Doctor of Divinity. Dr. Rumple and Jane Elizabeth, daughter of Watson W. and Malinda Rankin Wharton of Greensboro, were married in 1857. She was a trained musician and for several years operated a music school. The Rumples had three children that survived infancy. Watson Wharton born in 1859, James Wharton Walker born in 1861, and Linda Lee. Watson died early in 1877 from an injury to his ear when he was hit by the ball while playing baseball during the fall session of his senior year at Davidson. James completed his studies at Davidson and became an attorney but he drowned in the Shenandoah River in 1893. Linda Lee married C. G. Vardell, D.D., who was pastor of the First Presbyterian Church in New Bern and then the founding president of Flora McDonald College in Red Springs in 1896. It was at the home of Dr. Rumple’s daughter, Linda Lee, that he passed away on January 20, 1906 after several months of declining health. He was buried in the Chestnut Hill Cemetery in Salisbury next to Jane who had died on July 6, 1902. Pastor Rumple had delivered his last sermon on October 8, 1905, “Let all your things be done with charity” (1 Cor. 16:14). It was a fitting final proclamation of the Word by one who showed charity to many and helped when needed. Jethro Rumple’s publications show his interest in history. He published A History of Rowan County in 1881, and he wrote a series of articles between 1878 and 1887 on the history of Presbyterians in his state for the North Carolina Presbyterian. He was a contributor to and coeditor of Alfred Nevin’s Encyclopedia of the Presbyterian Church in the United States of America, 1884. In 1887 he edited First Semi-Centenary Celebration of Davidson College, Addresses, Historical and Commemorative, Delivered at the Annual Commencement, Wednesday, June 13, 1887, which includes a forty-six page address by Rumple on the history of the college. The tendency of the biographies on Presbyterians of the Past is to present the individuals as though they had neither faults nor failings. Part of the reason for this is that many of the biographical articles on this site depend upon obituaries and memorials and such sources are not likely to speak ill of the dead. Even Alfred Nevin’s Encyclopedia of the Presbyterian Church, which one might expect to expose some theological controversies instead presents its biographical subjects primarily without flaws. But in the case of Jethro Rumple a couple of less than nice items have been recorded. These are not intended to pick on Dr. Rumple in particular but are instead presented to show that despite his faithfulness and dedication to ministry, all things were not rosy. He was a sinner redeemed by God’s grace, and he, like any other Christian, succumbed to temptations. 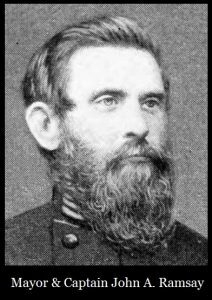 One example, likely the only other example on Presbyterians of the Past, that has been presented flawed is Robert J. Breckinridge. An article by George Raynor provides the assessment of one Salisbury woman regarding Pastor Rumple’s sermons. From three-quarters to a full hour was allowed for the sermon, old fashioned with its bones of structure fully visible, its fourthlys and fifthlys in sequence. When at last the sermon was over and the last hymn was sung, Dr. Rumple would end the final prayer with a warm “Aye-men” in a tone that sounded as if he were glad to be done; and I would be glad with him (p. 50). Raynor also, pages 48-49, tells of an altercation between Dr. Rumple and a member of his congregation. 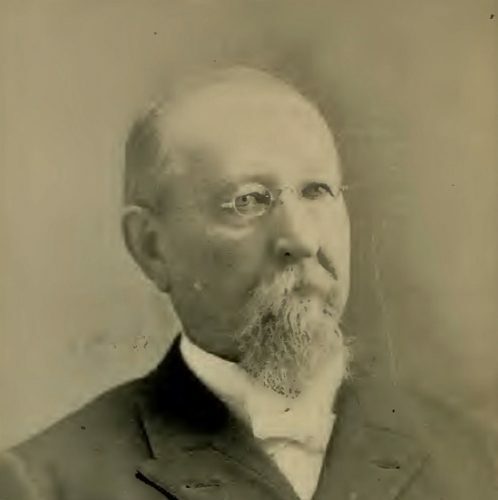 The member was Mayor John A. Ramsay. Apparently, the mayor said something to Pastor Rumple which was interpreted as a personal insult, so he hauled off and punched the mayor. It should be pointed out here that Ramsay had achieved the rank of captain during the Civil War, was wounded, and had participated in several important battles. The extent of the altercation is not known, but the case went before a packed courthouse and each man was fined 3.00. It must have been a highly humiliating and embarrassing situation—a minister and a mayor before the magistrate for brawling! It is not known whether Mayor Ramsay and Pastor Rumple publicly repented of their sin in the matter as Christians, but the altercation brought shame on the Lord’s church and apologies would have been appropriate. Notes—It is unfortunate that the name “Jethro” is associated with not being very bright ever since the days of sixth-grade-educated Jethro Bodine of the Beverly Hillbillies. It is a noble name because it was the name of Moses’ wise father in law יִתְרוֹ who advised him to establish elders over groups of the Hebrews for more efficient leadership. Flora Macdonald College merged with another Presbyterian institution in 1958 to become what is currently St. Andrews University in Laurinburg, North Carolina. The classmates and Philanthropic Society of Davidson College erected a monument for Watson W. Rumple, who was a month short of his eighteenth birthday when he died from his sports injury. Sources—The biographical entry written by Dr. Rumple’s daughter, Linda Lee Vardell, which prefaces the 1916 edition of his 1881 first edition book, A History of Rowan County North Carolina, was helpful. 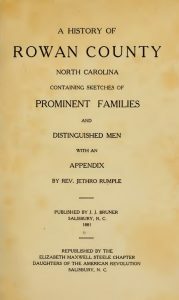 The George Raynor article mentioned is titled, “Jethro Rumple: Pastor and Author,” and it is found on pages 46-52 of Piedmont Passages: VII, Religion and Education in Piedmont Carolina, 1991. The source cited by Raynor for the Rumple-Ramsay incident is The Carolina Watchman, which is the Salisbury newspaper, and the year was 1884. The information on Watson Rumple’s death was located in The Danbury Reporter, North Carolina, February 1, 1877, page 2, and The Alamance Gleaner, January 23, 1877. The online NC Pedia provided the information about Captain and Mayor Ramsay. The Synod of North Carolina of the Presbyterian Church in the United States (PCUS) published a memorial for Dr. Rumple in its minutes for 1906. The biography in Dictionary of North Carolina Biography, edited by W. S. Powell, Vol. 5, P to S, UNC Press, 1994, by Neil R. McGeachy is good; McGeachy also authored a very helpful book, Confronted by Challenge: A History of the Presbytery of Concord, 1795-1973, 1985, which includes several transcriptions from presbytery minutes and associated documents.